During the discontinued friction strengthening except of the high-speed friction the processes of high-frequency shock loadings appears in the tool-part contact zone. The vibrations occur in the machine elastic system. During the vibrations of elastic systems, in the material of elastic elements and in the connecting units of the structure parts the energy dissipation into the ambient medium takes place. The energy dissipation of vibrations occurs due to the influence of the inelastic resistance forces on which the energy of the oscillatory system is spent. The vibrations of the tool-part system during the friction strengthening are similar to forced oscillations. However, for some particles of the part these oscillations are damped ones because the tool moves along the surface. 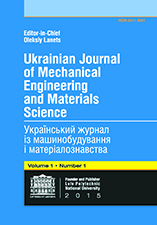 The vibrations of the elastic system of the machine during the discontinued friction strengthening in the first approximation may be considered as free oscillations. For their investigation let us use the method of shock (impact) perturbation with a help of special measuring hammer which allows defining of the damping coefficient. With a help of the accelerometer and the hammer the shock (impact) curve and the registration curve of the tool-part vibrations were obtained. The obtained registration curve of tool-part vibrations was expanded into the Fourier series and with a help of MatLab program the obtained signal was filtered. Due to determination of the amplitude of vibrations and the oscillation period the logarithmic decrement of damping was defined. This parameter may be used for determination of the dynamic parameters of the oscillatory system of the converted machine. For defining the oscillations which arises in the part being machined we used the dynamometer, in which the piezo-crystal sensor was rigidly fixed. This sensor allows the readout of oscillations along three directions (along vertical, horizontal and transversal axis). Experimental research showed that the amplitude increased with increasing the number of processing modes and the oscillation character has exact wave-like form. The working process along the longitudinal direction has step-wise character. The single contact zone is heated to high temperatures; the metal softens; the friction coefficient decreases and the step-wise transportation of the part along the longitudal direction is being carried out. These phenomena are also confirmed by the figure of the machined surface and by the results of investigation of the topography of the machined surface. It is also experimentally determined that horizontal and vertical displacements of the spindle and the table vibrate with the frequencies close to resonance ones. With increasing of the tool rotation speed these vibrations have the character of damped ones and this phenomenon allows reducing the parameters of roughness, undulation and flatness of the surfaces being strengthened.